Over the summer we introduced our kids to Harry Potter and they were very pleased to make his acquaintance. We checked out the audio books from the library and the kids were entranced. As we finished a book we'd watch the movie, which we did four times over. On July 31st we even celebrated Harry's birthday. Ben listened to the fifth book but then was told he couldn't listen to any more until he'd read the ones he'd listened to. L, our oldest, lost patience with our pace in audio book 3 and picked up my old copies, finishing the whole series in no time. 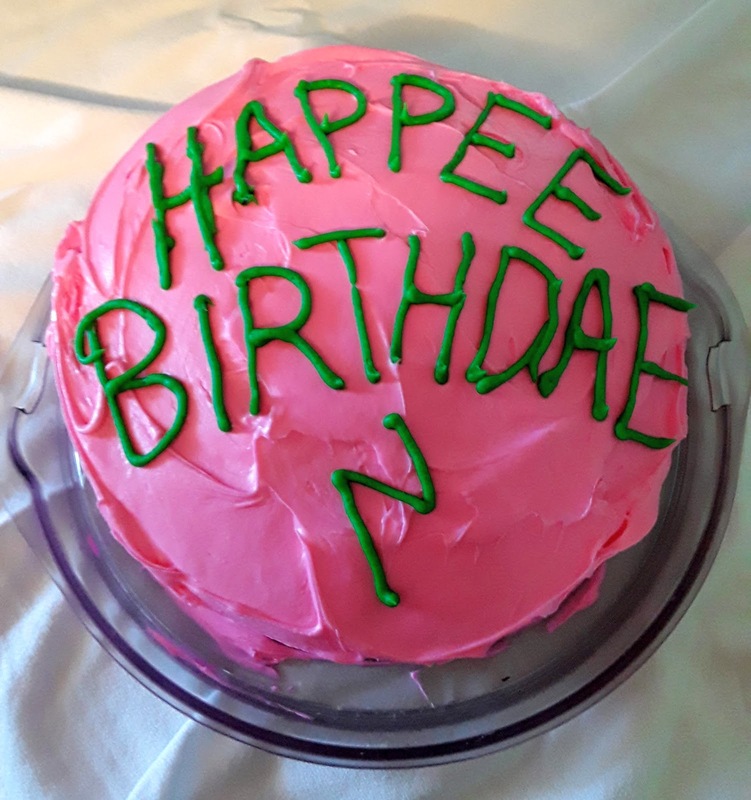 It wasn't a surprise then when Ben and JF, both with September birthdays, requested a Harry Potter themed birthday party. You guys, I have been waiting for this day for years! 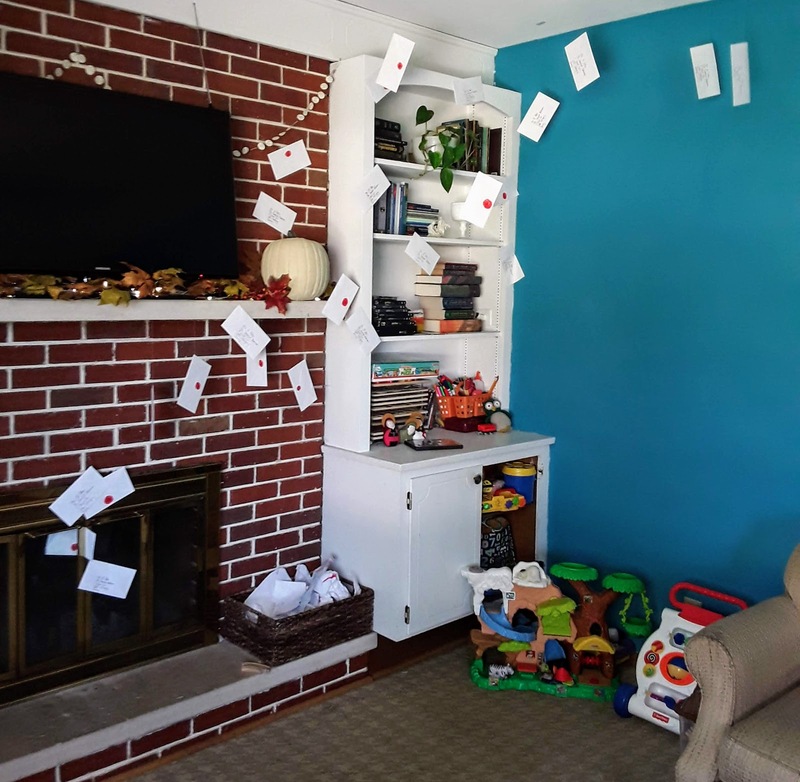 We started with Hogwarts acceptance letters, which were tied to a flock of white (balloons) owls, and hand delivered around town. Of course I didn't get a picture of them but they pretty much looked like what Kathryn did here. 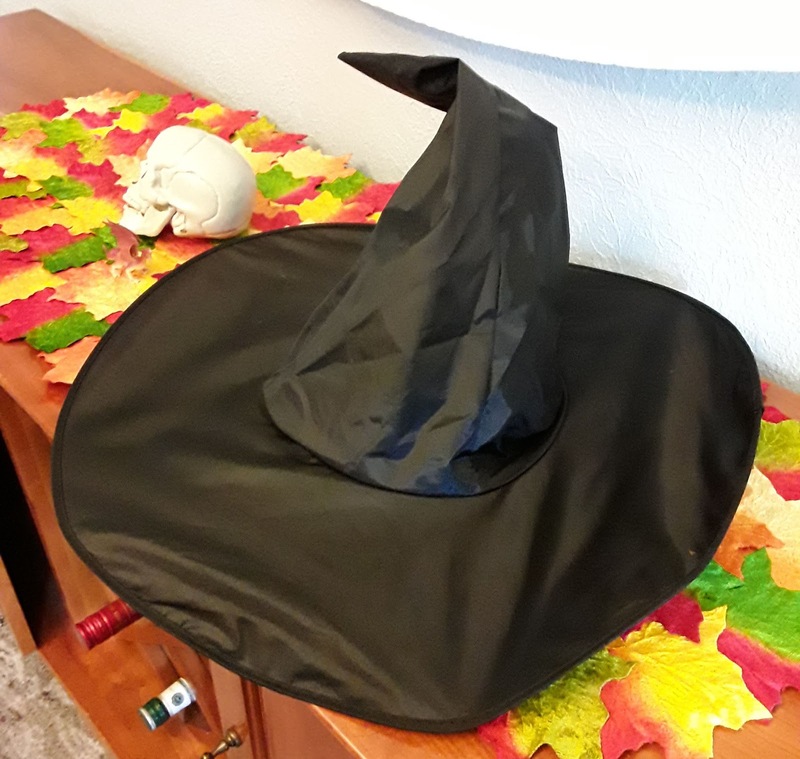 I then enlisted the kids' help with decorations. 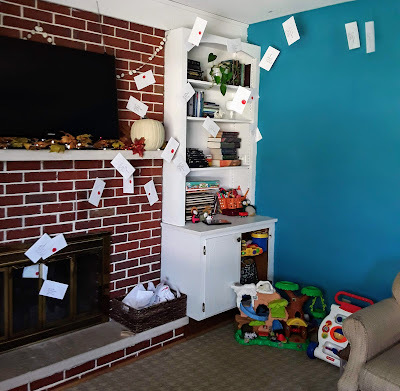 I addressed envelops to Harry, had the kids seal them and draw red "sealing wax" circles on the back, and then we made H's for Hogwarts on the circles. These came flying out of the fireplace, just like what happened on 4 Privet Drive. When kids arrived for the party they entered through Platform 9 3/4. Their first stop was Ollivander's Wand Shop. We printed off a sign and taped it to our tv in the living room. 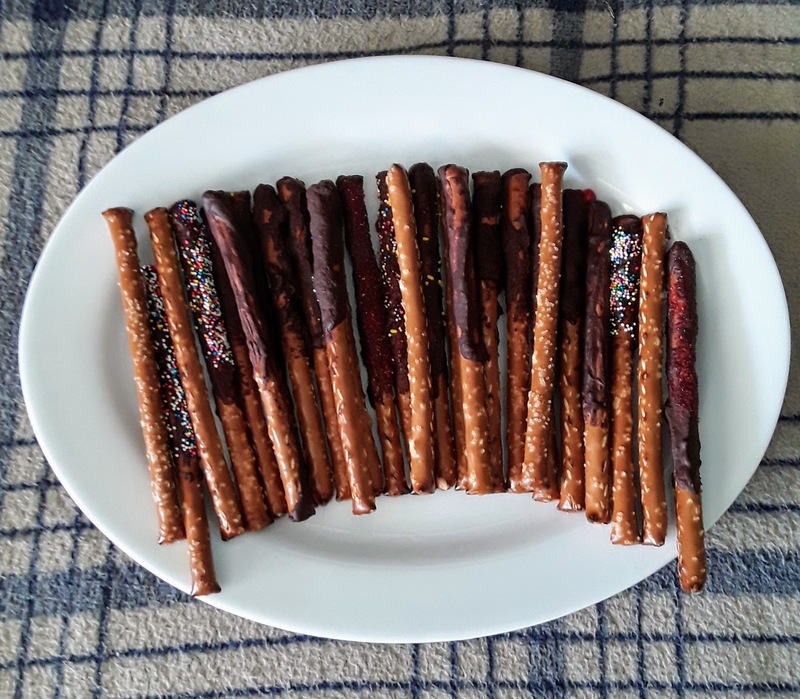 Then on a small table we put a plate of wands (pretzel rods - some plain, most covered in chocolate, and most of those with some sort of sprinke). The kids chose a wand (or the wand chose them) and they started snacking. We then ushered them into the Great Hall. 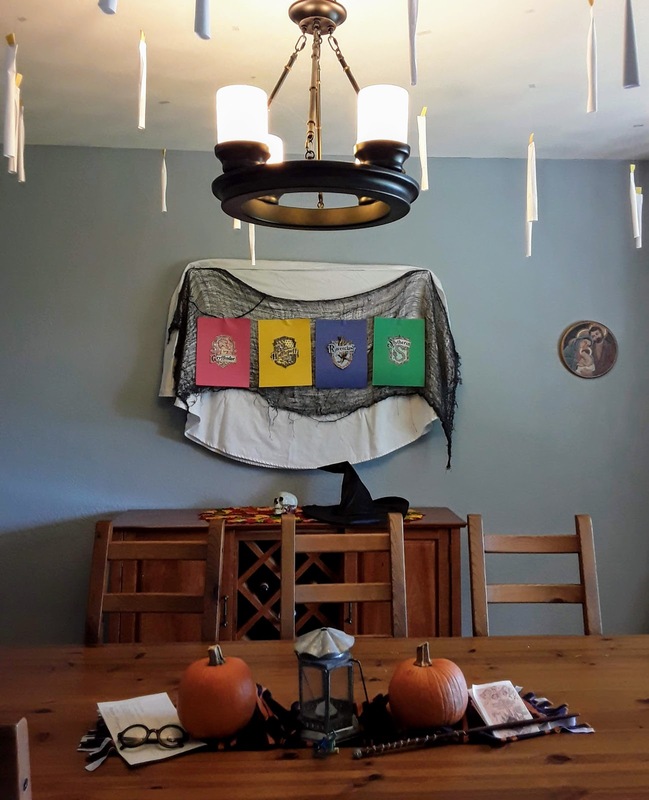 I had rolled up paper, stapled slips of yellow construction paper to the top, and hung the "candles" from the ceiling. 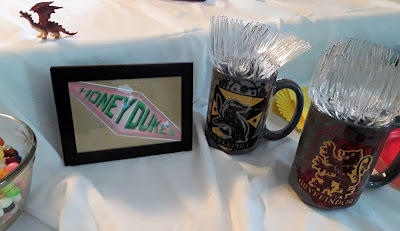 L colored the Slytherin, Gryffindor, Hufflepuff, and Ravenclaw house crests that I printed off the internet and we mounted them on construction paper. We also used Harry's glasses, a Gryffindor scarf, and a wand for the centerpiece. Next we started the Sorting Ceremony. 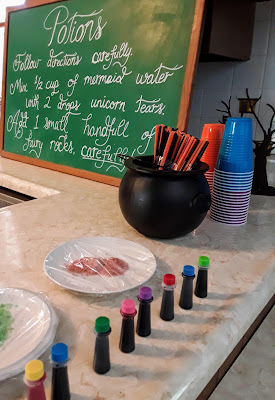 This was a favorite part of the entire party. Days before the event I texted every parent and asked them to give me three words to describe their kids. If the parent was familiar with Harry Potter I would confirm the House I planning on sorting them into, otherwise I just did my best. Before the guests arrived we sent our kids into the backyard to play and our friend Joel snuck into the house with his bluetooth speaker. He and Travis strapped it to the back of a patio chair we had brought into the Great Hall. Because of the design of the chair and the average height of elementary school aged kids the speaker was right behind their heads. Then Joel hid in a bedroom down the hall with a list of all the kids, the adjectives their parents had given me, and their House. When it was time for the Sorting Ceremony Travis, who was linked to the Bluetooth speaker, called Joel, who gave an Oscar-worthy performance as the Sorting Hat. Everyone cheered, laughed, and clapped and was so excited to see which House they would be in. 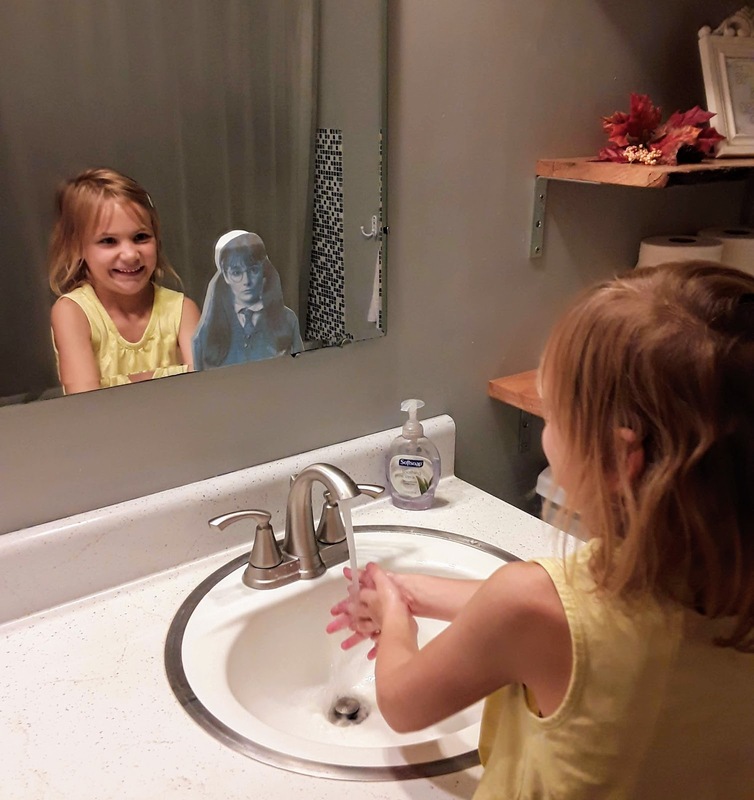 Even the kids who had never heard of Harry Potter loved this part! Once all the kids were sorted we started classes. I kept JF and his friends in the kitchen for Potions class. They mixed mermaid water (Sprite) with unicorn tears (food coloring) and fairy rocks (Poprocks). This was another huge hit. 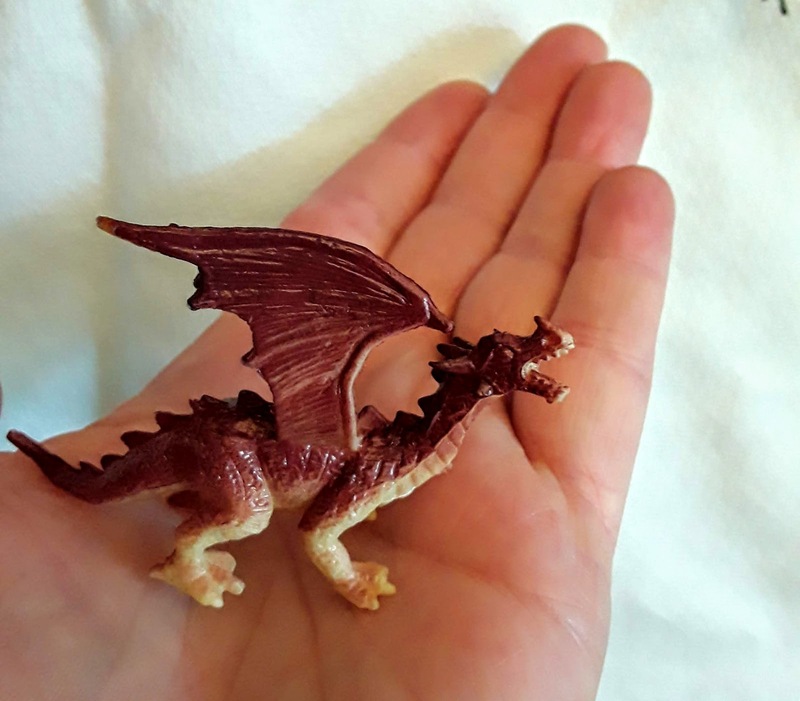 Meanwhile Ben and his friends were outside finding dragons in Care of Magical Creatures. They also just ran around, played on the swingset, and jumped on the trampoline. Each class then switched. 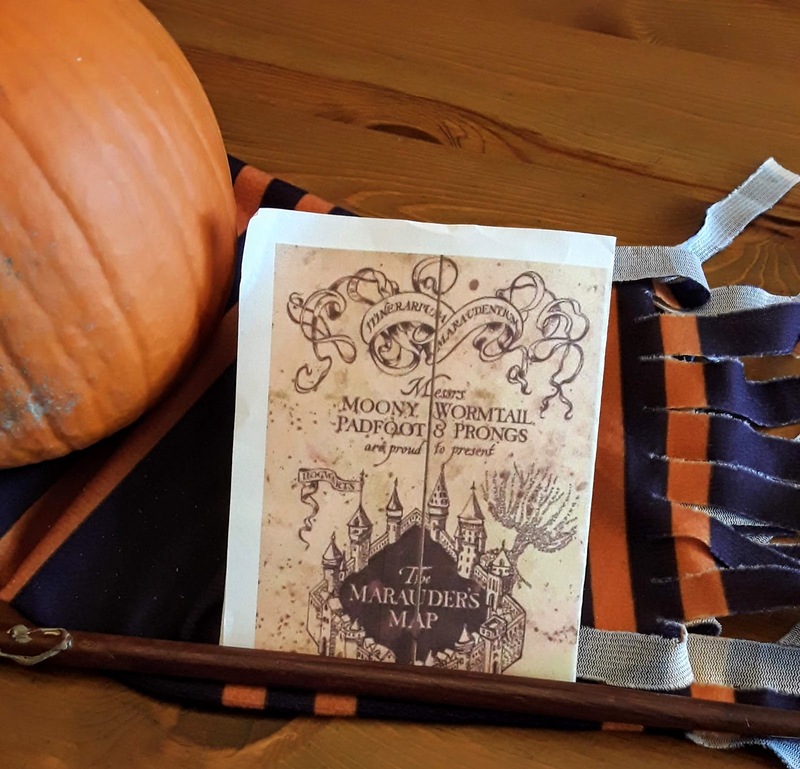 After classes were done, Travis pulled out the Marauder's Map and made each kid solemnly swear they were up to no good. He then led them through and around Hogwarts while I switched over the Potions classroom into Honeydukes sweet shop in Hogsmeade. They went out the backdoor, in the basement entrance, through a maze Trav had made in the basement, through several rooms, and out the egress window, around the house, and back to the kitchen. You can see it on the HP Party Video on my Instagram account. and then they indulged in lots of good treats and sweets at Honeydukes. We sang Happy Birthday to the boys and served the cake and the kids had refills on their mermaid water. 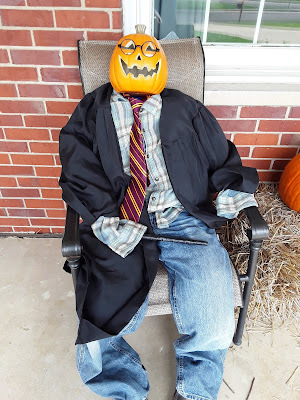 After all the sugar they were sent outside to run around until their parents came to pick them up, greeted, of course, by our front porch's scarecrow who had dressed himself up for the party. It was such a fun day, and while it took a lot of time and planning to pull it all off it didn't feel like much work at all because of how fun it was for me. Also, we had those envelopes and candles up for at least a month! 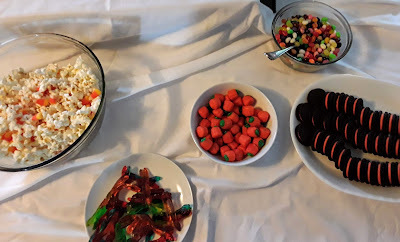 My kids loved the party and their guests had a great time. I will confess, there were probably as many parents who were re-living their childhoods right along with me at this party, too. 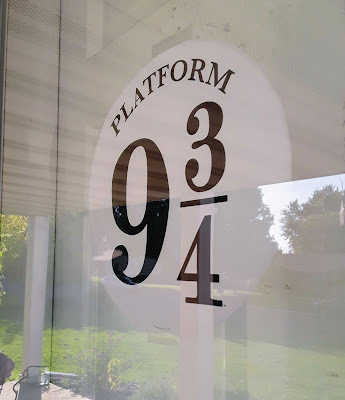 I know HP is not for everyone but it has been a blessing for our family and this party was just the best. So cute!!! I'm sure I'll be revisiting this post for ideas at a later date 🤗 i have the first two books in the illustrated versions and we are on the second one now as our bedtime read aloud. The kids love them and I love sharing it with them!